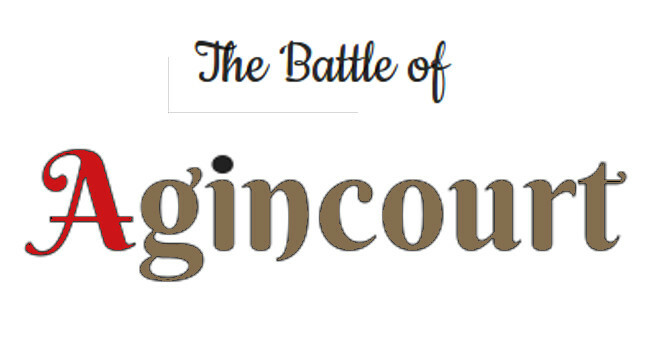 For a battle that is little more than a footnote in history, Agincourt certainly sits in the mind of the English consciousness. Well, that probably has a lot to do with Shakespeare, who wrote an entire play focusing on this battle, and this is one of the reasons why I have decided to write a post on the subject. Then again, I had also visited the village of Agincourt when I was last in France, and I was rather surprised to discover an entire museum dedicated to the battle. In fact, this museum is probably the main reason that this tiny village is actually on the map, and I suspect that the reason for this is because a lot of English people travel to France simply to see the site where a rather insignificant battle was fought some six-hundred years ago. At first, all I expected to discover were fields of corn and that was it, however as you drive along the road into and out of Agincourt you will discover a number of wooden soldiers along the side of the road, effectively marking where the battle was fought. Well, sort of because the fields happen to belong to the farmers, and I doubt they are going to be all that thrilled with people traipsing across their paddocks simply to reenact a battle. However, when I arrived I discovered that they had also set up a museum that takes us on trek back in time to see, learn about, and experience the battle. However, before I go on let us look at a bit of context. I first heard about this war in university. In a way it is interesting how as I have grown older my understanding of our past has been slowly pieced together. Before I returned to high school I had heard of Napoleon, and I had heard of the French Revolution, but I never realised that the two were actually connected. As for the Hundred Years War, well, I had heard of the Norman invasion, and I had heard of King Richard III, but this war that lasted from 1337 to 1452 was completely new to me. In fact, while I had heard of Jean d'Arc, I never realised that she was connected to this war, or that the role that she played was incredibly important to the France that we know of today. The general consensus is that the Hundred Years War began in 1337 when King Phillip II of France confiscated the duchy of Aquitaine from the English which resulted in Edward III declaring war against the French. However, I am inclined to suggest that the war dates back to the Norman Conquest, which is the main reason why the English had possession of the Duchy of Aquitaine, as well as Normandy. In fact, England was ruled from Rouen for much of that period, and it was only after the Capetian conquest of Normandy in 1204 that the King of England returned to England. However, England still had control over a number of French territories, and it had been French policy to basically 'kick the English out of France'. In 1316, a rule was established to prevent a woman from assuming the throne of France, which created a problem when the last of the Capetian kings, Charles IV, died without a male heir. This meant that Edward III of England was the next in line, but because he was only heir through the female line his claim was rejected and instead it was handed to Phillip of Valois, which was the former king's cousin. The war started when Phillip decided that he wanted to move against the English territories, and Edward responded by sending troops into France. The initial phase of the war was disastrous for the French, with them losing a number of battles, and with Phillip also being captured by Edward's son The Black Prince. 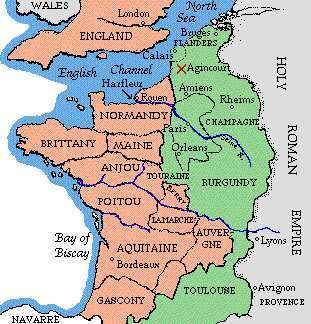 This resulted in a peace treaty, and control of vast areas of France under English rule. From 1360 the war settled into a stalemate and a war of attrition, namely due to the death of The Black Prince thanks to the plague, and the ascension of Richard II to the throne of England. However, while England erupted into turmoil, thanks to Henry IV overthrowing Richard, France wasn't much better with a mad king and rivals to the throne fighting each other for control. This culminated in the assassination of the King's brother in 1407, and the division of France into two (or rather three if you include England's possessions), that being the Armangnacs, the supporters of the Duke of Orleans, and the Burgundians, the supporters of John the Fearless, who chose to remain neutral in the conflict. This is a split of which the new King of England, Henry V, took advantage, thanks in part to John the Fearless' neutrality. Sometimes, actually a lot of times, it is tempting to simply accept history as it has been written down, but the thing is that the further away in time we go, the less reliable our sources become, and in fact the less frequent our sources become as well. These days we live in the world of the 24 hour news cycle were pretty much everything is record, and painful research goes into what we know of the past. However this wasn't always the case, and in fact modern processes of history simply did not exist back in the days of the Hundred Years War. Sure, there is the suggestion that history is written by the winners, but when we consider that a bulk of our knowledge of the Peloponessian War comes from Thucydides, an Athenian, and was on the losing side of the battle, this doesn't always stand up. The other concern is that accounts generally weren't written down until years later, though back in those days memory tended to last a lot longer than our days where almost anything can be found by a Google Search. Two of the eye-witnesses of Agincourt were actually children at the time of the battle, and didn't write of their experiences until at least twenty years later. However, we do have a poem by Alain Chartier, which is the Book of the Four Ladies (the only copy on the internet was a scanned book that is not only written in French, but it is written in that spidery script of the time), about sorrow of four French women who lost their husbands in the battle. Another source we have is a treatise on military strategy written by Jean Beusil around 1470, which emphasises the importance of leadership. Mind you, this battle is probably one of the most well known of the battles of the Hundred Years War, probably thanks in a way to the works of William Shakespeare who immortalised it in the story of Henry V. However, as suggested, much of these works tended to be rather subjective, and as I had discovered at University, using Shakespeare as a source to talk about the battle (and the war) simply does not work (and further, I completely missed out the other plays that occurred during the war as well, namely because they didn't include any fighting in France). However, despite this, there is no lack of writing from the time about the battle. Yet despite the battle having a significant number of records, there is still a lot of debate over the exact composition of the armies, and the advantages that they faced. In fact historians go from a figure of 4 to 1 to as high as 10 to 1. While we do have a play based around this king, we should also remember he is also the same Hal in the two Henry IV plays, the one who is living a wild life with Falstaff and his companions. However, it isn't the play that I am interested in here, but rather the man. He initially stood out while still a prince in the Battle of Shrewsberry where he defeated the Welsh rebel Owen Gwendower. However, as a king, his reign was quite short, lasting from 1413 to 1422, yet it was a reign which reinvigorated royal power, namely due to his personality and has charisma. Mind you, this wasn't to last since England was shortly to descend into the bloody war of the Roses and the reign of Richard III. 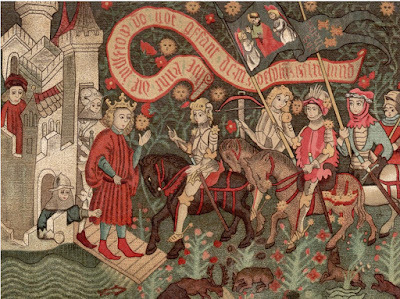 Shortly after ascending the throne, Henry put down a rebellion of the Lollards, which no doubt cemented his authority, and also prevented the disaster that cost Richard II the throne. During this time, he also made a claim to the French throne, since he was not only a Plantagenet, but also a descendant of William the Conquerer. However, he was tricky in this part since he sent negotiators into France, and while the French were distracted, he began to raise an army, reactivated the shipyards in Southhampton, and also rented a number of ships to help him make the crossing. When the French realised what was going on, they sued for peace and offered him the hand of Catherine in marriage, a huge dowry, and of course the duchy of Aquitaine. However Henry wanted more, so he promptly rejected the offer. He then marched into France in 1415, and scored significant victories at Harfleur (modern day Le Havre) and Argincourt, thus paving the way for the conquest of Normandy. He then forced the French to sign a peace treaty in 1420, and made himself the regent of France. He also married the French princess Catherine, but then died three years later at the age of 34, leaving the only heir to the throne a nine month old baby. The capture of Le Havre was important in that it was situated at the mouth of the Sienne, thus giving Henry control of a vital trade route into Paris. Even while the French had an overwhelming numerical advantage, most of the battles during the war ended with decisive English victories (with the exception of those led by Bertand du Geusolin). The reason for this was due to England's use of tactics and recruitment. The thing is that back in those days the standing army didn't exist. In fact armies were raised by the King who called on his lords to field troops on his behalf. However, there were professionally trained soldiers, but they tended to be in the form of knights (and mercenaries). The ordinary soldier generally worked the land, and the only weapons they had was that which they purchased with their own funds - they didn't even necessarily know how to use them. The English operated on a different system - the king had the lords bound to a contract to provide troops when needed. This was initially implemented by Edward III, but was later reinforced by Henry V. There was also a levy imposed, though these troops were generally used for home defence. Another thing with the indenture system was that there was a ratio required, usually three archers for every men at arms. The army also consisted of tent-makers, armourers, and even surgeons, and was actually quite small in size (around 12000). However, the siege of Harfluer reduced this even further due to the plague, and also the need to leave garrisons at conquered towns. Thus, while the English army at Agincourt was small, it was experienced and well disciplined, while the French army had only been called up quite recently, and not only lacked experience, but also integration (which was due France's use of Geonese mercenaries). The success of the battle was due to the formation and tactics that Henry used - by deploying his archers, which comprised of at least three-quarters of his army, he was able to win the day. The English weren't the only ones to have missile weapons, as the French utilised crossbowmen, including mercenaries from Genoa. 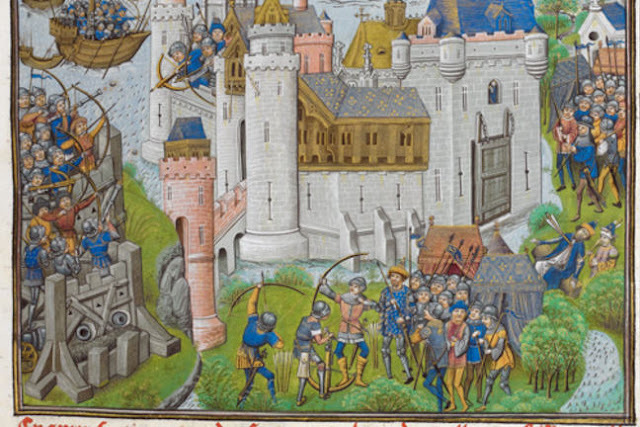 However, the difference was that the English archers played an important role in the battle, and while the crossbows could have been a match for the archers, the French did not utilise them effectively, reducing them to only a secondary role. As such, when the initial cavalry charge was made towards the English, the archers were easily able to blunt this attack through the use of their long distance weapons. Further, due to them being lightly armoured, they also made an effective fighting force in hand-to-hand combat. After Henry captured Harfleur things seemed to start going badly for him. He decided to march to Calais, another important port two hundred kilometres from Harfluer, but shortly after moving he was suddenly attacked by French troops. In fact in the march across Normandy he found that he was regularly being harassed by troops and also subject to cavalry charges, though he managed to fight them all off. The original plan was to cross the Somme river, however upon reaching the Somme he discovered that the French had destroyed all of the bridges. The French had set up in positions on the far side of the river, and Henry was having a terrible time looking for a ford or a bridge that hasn't been burnt down. Every time he reached a ford, he discoverd the French on the other side, and attempting to cross the river while being harried by the French isn't the wisest of battle tactics. However, he eventually found a way to cross the river, and while still being harassed by the French, he is approached by three heralds who advised him that the French will meet the army in battle, at a time and place of their choosing - through the use of scouts Henry discovered that this place was the village of Agincourt. The problem was that Henry doesn't want to fight a battle, particularly since the French not only had the advantage, but his troops were also exhausted from the forced march. However, both armies decided to settle down for the night in preparation of the battle that was to come. However, Henry, knowing that he simply would not be able to take the advantage, settled down for a short night, and them went to mass at a local chapel before setting off for battle. The troops were arrayed across from each other. The cream of the French troops were on display, consisting of heavily armoured knights (tanks if you will). As for the English, they were positioned a kilometre away, with the troops arrayed in two lines. 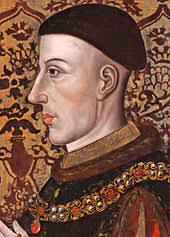 Henry took command of the bulk of the force, and the duke of York in commanded the flanks. Interspaced between the troops were the archers, set in triangles to allow a 360 degree field of fire. However, a bulk of the archers sat on the flanks so as to create a kill zone through which the French must cross before engaging the English. They also set themselves up behind a field of stakes, creating another impediment for a cavalry charge (which they were basically expecting). 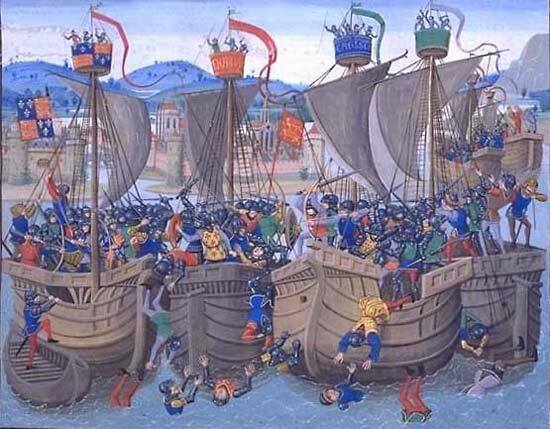 In an attempt to avoid battle, Henry offered the return of Harfleur which the French had initially requested, and the counter offer was for Henry to abdicate his throne in favor of the French, which, not surprisingly, was also rejected. As such the two forces faced off against each other for several hours, neither wanting to make the first move. The English then made the first move, marching into bowshot. The catch was that the French were on ploughed ground, while the advantage was with the English, who were on uncultivated land. The English then let off a volley of arrows which resulted in the cavalry charging, who were then cut down to the man by the archers. The injured horses turned around and charged back through the French troops, adding to further disarray. The French then moved towards the English, but once again their numbers worked against them. With forests to either side, they found themselves trapped, and the English archers proceed to draw their hand weapons and attack the French. The result was a slaughter which causesed the French vanguard to turn and flee. The battle then paused, and suddenly there is a shout from behind, and the English turned to discover that their baggage was being pillaged. However, this was only a minor incident, but the result is that Henry ordered the execution of all of the French prisoners, with the exception of the great lords. However, the battle had come to an end, and Henry was victorious. So, I guess the question is what effect on history did this battle have. Well, honestly, I think the French have the best answer to this question - not much at all. Sure, the short term results meant that the French had been decisively defeated and Henry was defacto ruler of France. We must remember that he only lived another seven years. Further, a much more important character was to come about a few years later - Jean d'Arc. While some of us may know of Henry, especially if we are familiar with the Shakespeare canon, pretty much everybody has heard of jean d'Arc. Though while it is possible that Agincourt set the context to allow somebody like Jean to arise, I need to look at the context a little. Without Agincourt, France was still divided, and the English still occupied large sections of the country, but not to the extent that it did after Agincourt. However, the main issue with Jean was that the French were clearly under the thumb of the English, and it was a complacent and defeatist nobility that she was challenging. Without this then it is unlikely that there would have been that sense of urgency that enabled Jean to arise. The thing is that Jean d'Arc had such an influence on history that it is hard to write about it in this post, particularly since it is about Agincourt. The French suggested that it was a minor battle that shouldn't have the significance that it has, and it is only the English pining for better times that the battle is remembered at all. Still, the English then went on to pretty much rule the world in the 19th and early 20th century, so this idea of remembering better days probably doesn't work as well. Yet, I guess when we look at the bigger picture, many of these minor events, as insignificant as they may appear, all work together to create the grand tapestry that makes up our history. In a sense, everything is connected. Great post. I hadn't really gone into that much detail in my study of Henry V and Agincourt.